Kariega Game Reserve near Port Elizabeth, Eastern Cape, South Africa, is an idyllic getaway. Enjoy Big Five safaris and peaceful river cruises on the Kariega River, which leads down to pristine beaches. Kariega Game Reserve in malaria-free Eastern Cape, South Africa, is an 80 minute drive from Port Elizabeth and 15 minutes from stunning beaches at Kenton-on-Sea. Abundant wildlife and 5 different eco-systems merge in a 10 000 hectare family owned and operated reserve. Port Elizabeth is the gateway to the Garden Route in the Eastern Cape, South Africa. Visitors will find Kariega Game Reserve to be an easily accessible Garden Route add-on for a great malaria-free Big Five safari in South Africa without unnecessary flights and transfers to other destinations. Apart from Lion, Elephant, Buffalo, Rhino and Leopard which make up the Big Five, this game reserve in Eastern Cape, South Africa is home to other fascinating species such as Hippo, Hyena, Giraffe, Zebra, Wildebeest, Eland, Kudu, Waterbuck and a variety of other antelope. More than 280 bird species, including nesting Crowned, Martial and Fish eagles have been recorded. Kariega is an Eastern Cape Game Reserve, situated about 140km (87 miles) from Port Elizabeth. P.E. has a national airport and excellent highways and tarred country roads all the way. The nearest small town with most amenities is Kenton-on-Sea, a 15 minute drive away. The coastal route on the R72 via Alexandria to Kenton-on-Sea, where you turn inland and proceed 14km (9 miles) on the R343 to the main entrance to Kariega Private Game Reserve (which will take you to Main Reception). Proceed on the N2 towards Grahamstown for about 110km (68 miles) and turn right before reaching Grahamstown onto the tarred road (R343) to Kenton-on-Sea for a distance of 32km (20 miles) to the main entrance to Kariega Private Game Reserve. You will arrive at a separate entrance to this Eastern Cape game reserve, specifically for River Lodge. You will be collected and taken to River Lodge Reception. Travel from Port Elizabeth along the N2 towards Grahamstown for approximately 50km (31 miles) and then take the Port Alfred turnoff, where you will then travel along the R72 towards Kenton-on-Sea and Port Alfred. The turnoff to River Lodge is signposted and is exactly 15km (9 miles) beyond Alexandria. 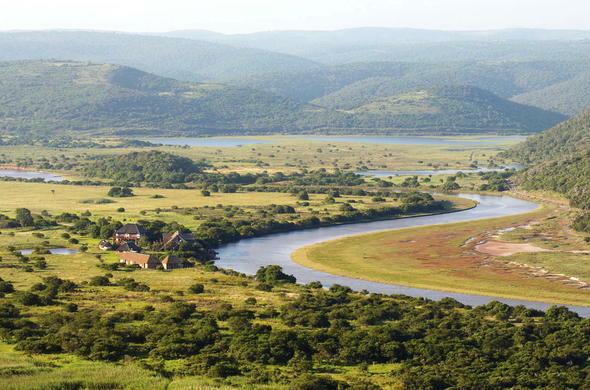 Kariega Game Reserve is located on the the Kariega and Bushmans Rivers in the Eastern Cape, South Africa. This malaria-free reserve is close to Port Elizabeth and Grahamstown. The wonderful beaches of Kenton-on-Sea are nearby.